Doctor Who has a history of overusing its most popular villains, going back to the age of Dalekmania. But meanwhile, some villains haven't gotten nearly enough screentime, or haven't achieved their full potential. Here are 10 Doctor Who villains who ought to have another go at conquering the universe. 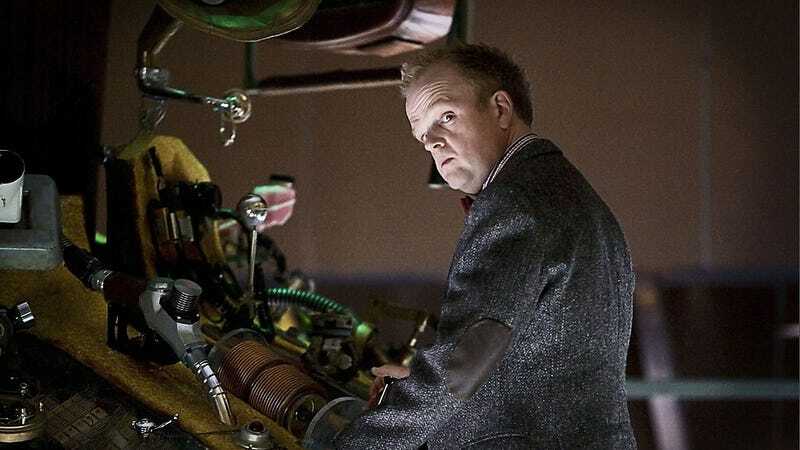 Yes, before anybody points it out, this villain who plunges Amy, Rory and the Doctor into a pair of deadly dream worlds in "Amy's Choice" is just sort of an aspect of the Doctor's self-loathing psyche, brought on by some weird psychic pollen. But that doesn't make him any less dangerous or creepy. He's a more dangerous manifestation of the Doctor's dark side than, say, the Valeyard, the evil alternate future Doctor who puts the Doctor on trial in "Trial of a Time Lord." And what if the Dream Lord found a way to gain independent existence, and could still trap people in horrible dream worlds? This is one of those villains who seems like he ought to be the Doctor's arch-enemy, but we still only see him the one time. The Doctor describes Fenric as "evil from the dawn of time," whom the Doctor trapped long ago with a weird chess problem (whose solution has never made sense to me.) Fenric is a master schemer, who creates incredibly complex traps, like sending super-vampires back in time from a post-apocalyptic future, that the super-vampires themselves are doomed to create. He's willing to use people's greed for knowledge, as well as their worst natures, against them — and he's one of the better "dark God" characters that Who has ever featured. In "The Mind Robber," the Doctor and his companions become trapped in the Land of Fiction, where stories become real — and unless they're careful, they'll be turned into stories themselves. The Master of Fiction is an old pulp writer who's been trapped there for years, making up stories to populate this otherwise blank universe — but who's trapping him there? We never learn that much about this creepy computer that sits in another universe and turns real people into its puppets. How did this computer find its way into a blank pocket universe, and why does it want to turn real people into stories? It feels like there's a fascinating story to be told there — even without overtly referencing the original story. We learn basically nothing about the creature in "Midnight", except that it's telepathic, and it can possess people, and it's drawn to the Doctor's intelligence. It's also very cunning, and adept at manipulating people to turn against each other. Possibly, if we saw this creature again, it would lose all its mystery and just become another comfortable baddie, and that would be kind of a shame. But it might almost be worth the risk, to see what would have happened, if this creature had made it back to the city. The Rani is one of those characters who's really cool in concept — but neither of her two stories really does her justice. She's another member of the Doctor's race, a Time Lady, who loves to do immoral experiments on people and planets and things. She doesn't want to conquer any planets, or destroy anything for its own sake — she's just a really unethical scientist, who doesn't care who gets hurt when she harvests brain chemicals from people or tries to build a super-time-brain-thingy. In her two on-screen appearances, she does a lot of scenery-chewing in tight pants, when she's not wearing a crazy mullet-wig and impersonating the Doctor's companion Mel. But the core of the character is terrific, including her contempt for the Doctor as well as his enemies. Douglas Adams only wrote three Doctor Who stories, and two of them feature villains that it would be hard to imagine recurring. But the third, the never-completed "Shada," has a villain with legs. (Which are mostly seen in shiny disco pants.) Skagra is a sarcastic, sardonic genius, who takes over a think-tank of other geniuses to develop a device that will allow him to steal other people's minds. Then he sets about trying to break into the lost Time Lord prison, Shada, to find a psychic criminal named Salyavin, who can project his mind into other people. Skagra basically wants to turn the universe into a single group-mind, with his consciousness in control over everybody. It's a clever plot, but what puts Skagra into the "deserves another shot" camp is his swaggering egomania. What if he actually gets to turn his mind into a virus, infecting tons of others and spreading across the galaxy? That would be kind of cool. Here's another villain — and another evil computer — that we never learned enough about. Gus is the computer on board the Orient Express, who traps the Doctor and Clara on a replica train in space, and forces them to figure out the nature of the mummy that keeps killing people. What makes Gus so great is his plummy Victorian-gent voice, coupled with a horrific ruthlessness when he doesn't get his own way. And as the Doctor remarks at the end, we never find out "who set this up" — and who's so horribly determined to understand and replicate the mummy's deadly powers. OK, so Kronos isn't strictly-speaking a villain — it's more of a monster. If Kronos is left alone, everything is copacetic. But when the ancient Atlanteans keep Kronos locked away for aeons, Kronos is pretty pissed when it escapes, and destroys Atlantis entirely. (That happens a lot on Doctor Who.) What's great about Kronos is, it's sort of an elder god, and sort of an elemental force, and sort of a mad titan. "The Time Monster," like the two Rani stories, is kind of underwhelming, and Kronos doesn't really get to shine — but you sense there's some great mythos there, about elemental beings from outside time, who sometimes break in to feed up on time or toy with mortals. It wouldn't be hard to imagine a story about the terrible things that happen when Kronos, or another Chronovore, gets hungry. These bat-like creatures, that can take on the attributes of all the species they conquer, remain a bit vague in their one and only outing. The focus in "School Reunion" is mostly on the Doctor reconnecting with Sarah-Jane Smith. (And K-9!) But the Krillitane have a few neat concepts to them, including the thing of extreme adaptability. And their ambition, to solve the most basic equation of the universe and achieve godlike powers, is something that seems like it could support more story. Plus they're aliens who turn kids into super-geniuses using french fries. That's something that really needs to be explored further.